Mons, Belgium, was the last town to be recaptured from the Germans before the end of the First World War. The Montreal regiment that was there in 1918 returned Sunday to mark the 100th anniversary. 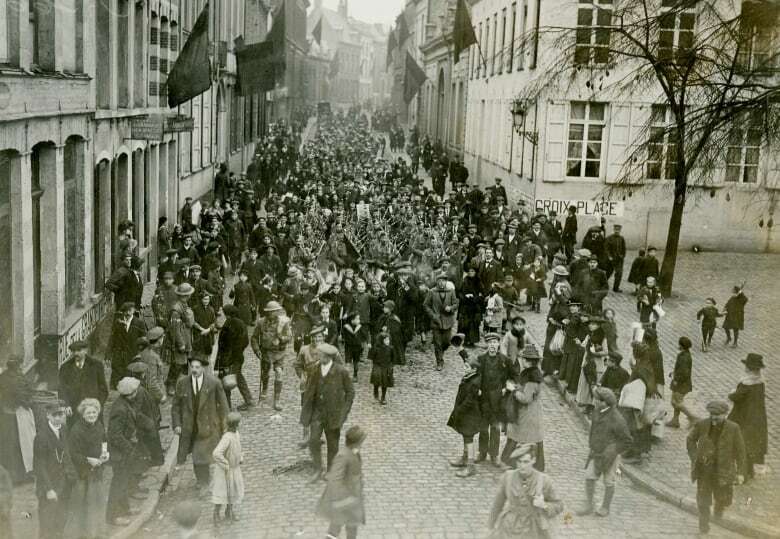 When Canadian troops marched into Mons, Belgium, 100 years ago, chasing away the remnants of the German army, locals weren't exactly sure where their liberators were from. The soldiers were wearing kilts, and some wore tam o'shanters. They looked like the Scots who had tried, unsuccessfully, to keep Mons from falling into German hands at the start of the war in August 1914. "We knew you would come back," the people of Mons shouted. The incoming troops, though, were from Montreal's own highland regiment, the Black Watch. Just a few hours after they and a battalion of the Royal Canadian Regiment reclaimed the town from the Germans, the Armistice went into effect, and residents joined the Canadians in celebrating the end of the First World War. 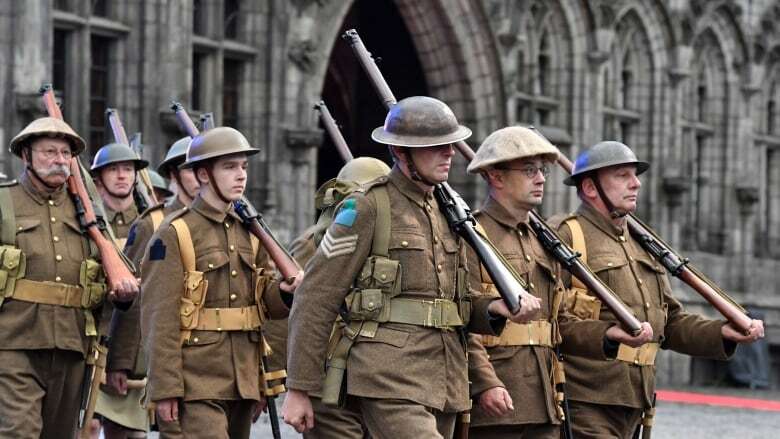 On Sunday, there was no mistaking the nationality of the soldiers, veterans and families who had returned to Mons to recreate the final scene of the war. Canadian flags, both big and small, filled the Belgian town. Around 11 a.m. ET, the pipes and drums of the Black Watch led a parade through the town's cobblestone streets, following a route similar to the one their predecessors took on Nov. 11, 1918. 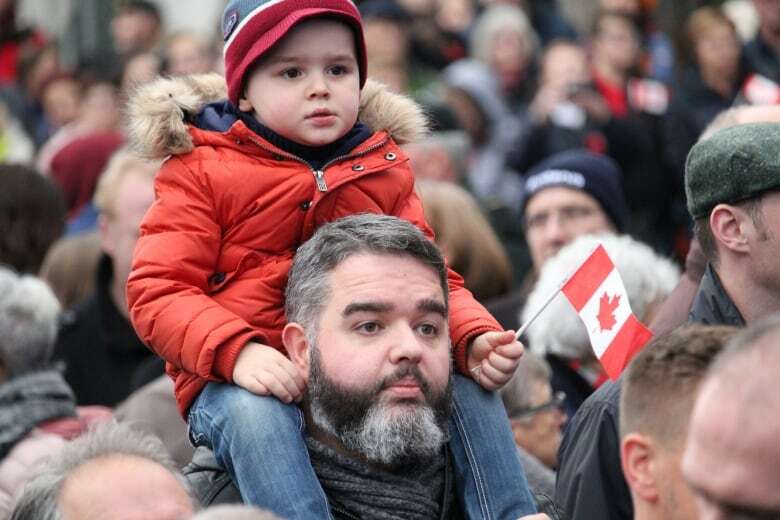 Several thousand people from the Mons area attended the parade despite the rain, applauding as the Canadian contingent marched past. "Little kids were coming up to us: 'Vous êtes Canadiens. Merci!'" Black Watch honorary Lt.-Col. Bruce Bolton said from Mons. "They were recalling a story from 100 years ago and were emotional and thanked us in every way possible." Bolton, wearing a vintage uniform, took up the position that piper Donald MacLeod occupied 100 years ago, leading the Black Watch into Mons. "He was one of my bagpipe teachers in the 1960s," Bolton said. "I'm doing this for him." The Black Watch sent several active duty soldiers to take part in Sunday's ceremony as well. Among them was Capt. Jawara Hinkson, a reservist, who works as a Montreal bus driver. "I've never experienced anything like this in my life," Hinkson said. "I'm definitely taken aback." Sunday's parade in Mons also featured representatives from other Canadian military units, Belgian military and members of the Belgian legion. Earlier in the weekend, a plaque was unveiled commemorating the Canadian soldiers who liberated the town. Indigenous dancers from Manitoba performed at the ceremony. The events marking the 100th anniversary of Mons' liberation and the end of the war introduced a new generation of residents to the town's history. "That our little town of Mons was saved by Canadians was maybe known by a few people. But the general public was not aware. So we came to see," said Sibel Meydan, 57, whose family has lived in Mons since the 1960s. Meydan attended Sunday's parade with a group of friends. They cried when they heard the story of George Price, a private from Nova Scotia who was killed on the outskirts of town just minutes before the war ended. "It's amazing to see that young men came from another country to give their lives for us," she said. "The freedom I have today is because of them."